Anti-Social Society is the most non-toxic, positive, friendly & chill place about forging friendships and inspiring creativity. Anti-Social Society is a community formed upon the idea of creating a place that is open to all, where anyone and everyone is welcome. 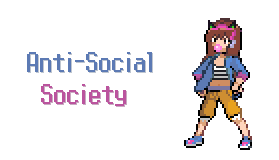 Anti-Social Society is about connecting people through their common interests and hobbies. We are about inspiring creativity and helping people find happiness. To keep people entertained and build up a sense of community, we have numerous activities and regular events. ▸ Regular free and paid giveaways! Running this community is a TON of hard work. We have a full team of over 30 staff members who are available around the clock to help with any problems anyone may have and keep our events running smoothly. In order for us to continue innovating and expanding, we need the help of people like you to support us on Patreon. We have many monthly bills that range from bot hosting to advertising fees and more. We are growing beyond the borders of just discord and have an upcoming website. All donations go towards helping achieve this goal and supporting the future of this family. Currently our combined costs of hosting, advertising and giveaways comes out to $500 a month. In order for us to continue doing giveaways, hosting our bots and advertising the server, we need your help! Any amount you could contribute no matter how small or large will greatly help us achieve this goal and make this community better and better for you all. Thank you so much for your generosity if you chose to support our incredible community. TONS of Kana features, commands and extra permissions to make you stand out as special! First *three* ranks free while subscribed! ALL ranks except newest free while subscribed! This role can only be purchased through paypal. To buy this role, DM Akira to verify the price. This role proves you have THE BIGGEST D. You get rewards from all equivalent tiers and lower. You get the highest position on the sidebar below bots and staff. Only one person may have this role at a time. To steal the role, you must donate HIGHER than the previous donator. Reaching this goal will allow for us to cover all monthly hosting fees and bills! Want A-SS game servers? We can do it now! !